ItвЂ™s not easy to get back to business again, but I canвЂ™t help that because Western Digital at last released its new Raptor! I personally have long been waiting for it. Hard drives with a spindle rotation speed of 7200rpm were increasing their storage capacity at a rapid rate to 200, 300, 400 and now to as much as 500 gigabytes! And the problem of choice between a Raptor and an ordinary drive but with five times the capacity was getting ever harder to solve. But now Western Digital reminds us about itself once again with its Raptor 150GB. To be exact, there are two new drives with 150GB storage capacity. One of them is quite an ordinary but larger Raptor, while the otherвЂ¦ Well, the other can store 150GB of data too, but it has a striking appearance due to a transparent window in its case through which you can watch the read/write heads working. I donвЂ™t recommend doing that for more than 15 minutes per day. ItвЂ™s just hypnotizing! So this model with a transparent window has got a unique name, Raptor X, and even a personal website where you can learn about its development and read its tech specs, see some photos, etc. And so it happened that it was a Raptor X that dropped in on our labs first. The window that you can have a peep inside the drive through is shaped irregularly, but the fastening of the platters block and the actuator and even, partially, the top read/write head can be seen quite well. 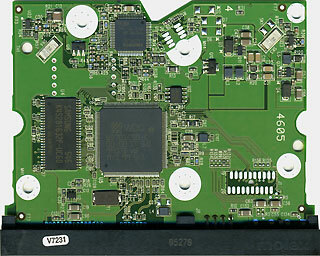 Western Digital remains true to its tradition of placing the electronics board with the chips facing inward. You may note one detail missing here вЂ“ there is no ATA-SATA converter chip on the visible side of the board. But itвЂ™s all right. 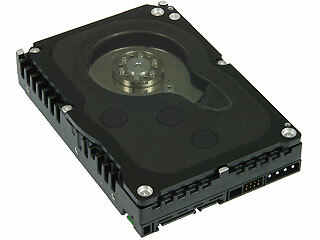 The chip shouldnвЂ™t be there because the drive features a native SATA interface. As you see, the PCB has only three microchips: processor, memory chip and motor controller chip. Also you can see two acceleration sensors in the top corners of the PCB. Accelerometers of the drive measure the vibration levels and corrects the current disk operations. But letвЂ™s get closer to serious matters now. Hard disk drives of the Raptor series have to meet tough requirements in the market sector Western Digital positions them into. HDDs that are to replace SCSI drives in workstations and entry-level servers must be fast, reliable and cheaper. The price factor isnвЂ™t a problem at all. 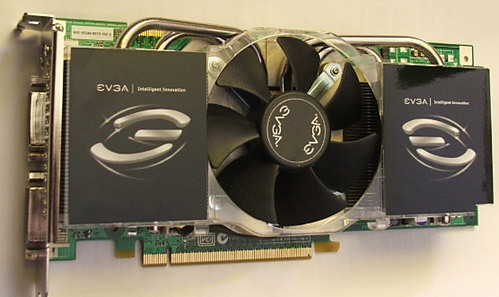 Raptor drives cost less than SCSI ones and do not require an expensive controller (in fact, the controller is usually integrated into the mainboard and is absolutely free). The speed characteristics of the new Raptor are what we are going to explore throughout this review. Reliability is a difficult question of course, but the second generation of Raptor drives seemed to me more reliable than the first. I hope the third generation is going to be even better in this respect. The new model boasts two times the storage capacity of the older one (so it can store 150GB now), a cache buffer for 16 megabytes, and support for NCQ technology. The speed of data transfers from the driveвЂ™s buffer to the host controller has remained the same at 150MB/s. ThatвЂ™s not a cause for grumbling since this parameter is not at all crucial for the driveвЂ™s performance. 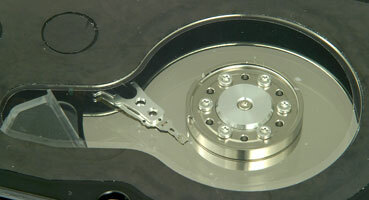 The HDD supports Western DigitalвЂ™s exclusive technologies called TLER (Time-Limited Error Recovery) and RAFF (Rotary Acceleration Feed Forward). The former is meant to improve reliability of the error-correction algorithms in RAID arrays, while the latter improves the performance of the drive when under vibration. ItвЂ™s the first time I am going to use our new testbed for hard disk drive tests. EverythingвЂ™s changing and we canвЂ™t resist the progress. We got dissatisfied with the old testbed due to the fact that we had built it exactly like an average computer system of that time. And our testbed has remained intact all through the following time, through the change of chipsets, processor sockets, memory types, etc. On one hand, that was good because we could accumulate a large database of results for comparison and analysis, but on the other hand, we were getting each day farther from the average computer configuration of our readers (or rather, our readersвЂ™ computers were getting more and more advanced in comparison with our testbed) and the results of our tests were beginning to lose touch with reality. When we were selecting benchmarks to be used in tests of hard drives on our site, we did try to stick to those of them which did not depend much on the CPU performance or the amount of system memory. And our trial runs of the new platform have showed that the hardware configuration has a much smaller effect on the test results than the operating system used. Yes, the main innovation of the new testbed is the operating system installed on it вЂ“ Windows XP SP2. Unfortunately, we didnвЂ™t make it to Vista because the implementation of the new WinFS file system in the OS known under the codename of Vista has been postponed for an indefinite period of time. This way we put hard disk drives with ATA and SATA interfaces under the same conditions since the employed controller supports both interfaces. 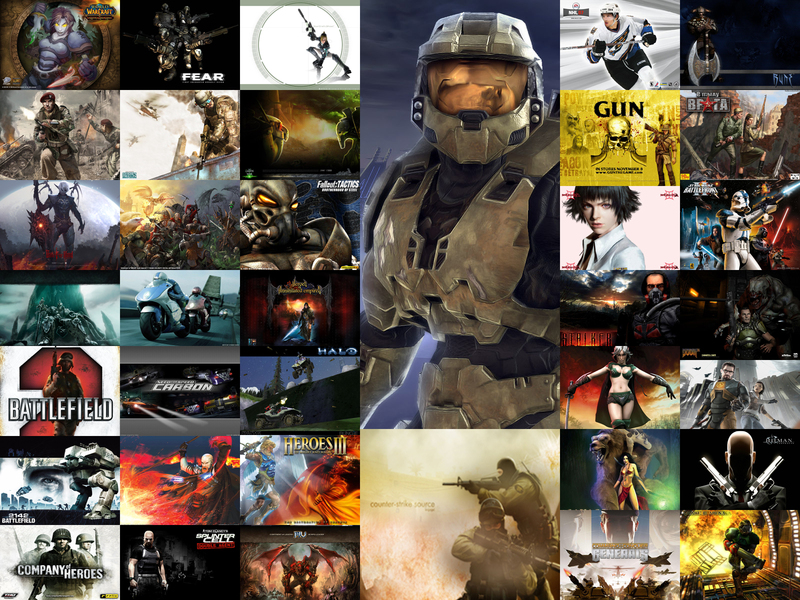 The reason why we took an external controller at all is quite simple. 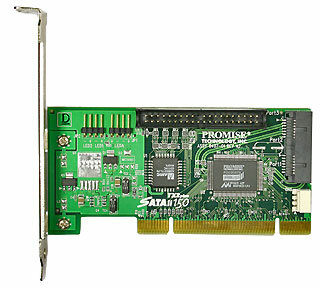 Thanks to Intel, thereвЂ™s only one connector for PATA drives on mainboards based on the i945+ICH7R chipset and this connector has to be occupied by the system HDD. The tested drives are formatted in FAT32 and NTFS as one partition with the default cluster size. In some cases mentioned below we used 32GB partitions formatted in FAT32 and NTFS with the default cluster size. The first test in this review is meant to check the average response time of a hard disk drive at reading/writing random sectors. The goal of the test is to measure the disk access time at reading and see how aggressive the drivesвЂ™ deferred write policy is (roughly speaking, we are going to see how many segments are allocated in the driveвЂ™s cache for storing write requests). So we make IOMeter send a stream of requests to read and write 512-byte data blocks with the request queue depth set at 1 for 10 minutes. 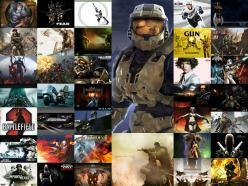 The total number of requests processed by the drive is over 60 thousand. This ensures we get a sustained disk response time in the end, which doesnвЂ™t depend on the size of the driveвЂ™s cache buffer. Here are the results of the drives in IOps (the number of requests processed per second). The more requests the drive manages to process, the faster the drive is, as you can easily guess. The two WD740GD clearly use different read-ahead policies. More interesting is that they also take different approaches to processing write requests! 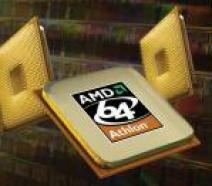 The WD1500AHFD is in between them in reading speed, but is far faster than both the WD740GD at processing write requests. Well, it would have been strange if it had done otherwise having twice the amount of cache memory. The results can be translated from IOps into traditional parameters вЂ“ read and write response time. The results themselves do not change, of course. They are just represented in a different way. IвЂ™ll soon get back to examining the drivesвЂ™ behavior at processing random read and write requests. Right now letвЂ™s check the speed of reading from and writing into the driveвЂ™s cache buffer. There are a lot of benchmarks to measure the speed of reading from the driveвЂ™s buffer, but unfortunately few of them are free from certain deficiencies. For example, the burst rate may be measured using small-size data blocks (in compliance with the old ATA/ATAPI specifications). Or the number of iterations may be dubious, too. The Raptor X is obviously better than the previous-generation drives in this parameter, especially when it comes to writing into the buffer. After all is said and done, the main and most intriguing feature of this review is the new hard disk driveвЂ™s support for Native Command Queuing technology. 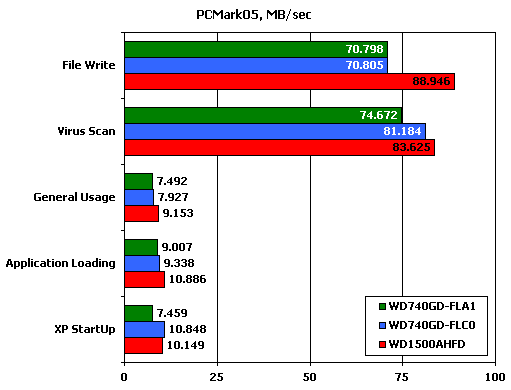 Western DigitalвЂ™s Raptor drives used to support only the so-called legacy ATA queuing. And WDвЂ™s market opponents would regard the word legacy as synonymous with obsolete or archaic , promoting NCQ instead. But you may remember that even that old and archaic technology did quite well in our tests. But now that the Raptors have acquired support for the most progressive commands-reordering technology, the competitors cannot really blame Western Digital (except for the companyвЂ™s growing profits :)). The WD740GD drives support Tagged Command Queuing (TCQ) whereas the Raptor X features NCQ. The Promise S150 II TX2+ controller supports both the versions of this technology, thus giving an opportunity of an all-around comparison. As usual, I use IOMeter to bombard the drive with a stream of requests to read random-address sectors while steadily increasing the length of the request queue. Thus, the controller has an opportunity to send independent commands to the drive (commands whose result doesnвЂ™t affect the queuing or processing of other commands). As you can see, the graphs are similar irrespective of the status of NCQ. So I think this proves that NCQ doesnвЂ™t work for write operations. But maybe it doesnвЂ™t work in this particular drive only? No. 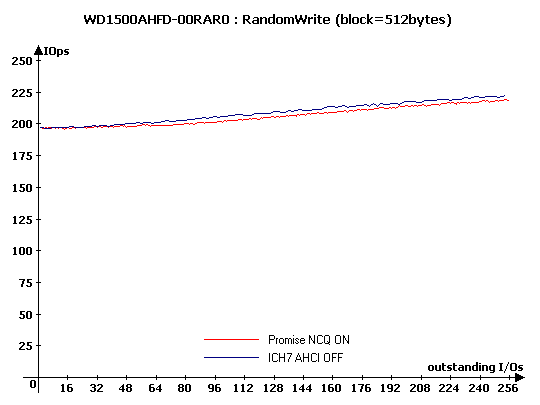 We tested a few SATA300 drives from different manufacturers and they were always behaving like the WD1500AHFD at high percentages of write operations. But whence comes this dislike towards random-address writes? Why are they not put into the common queue? I think the answer is very simple. It isnвЂ™t profitable. I mean you donвЂ™t get any performance gains by that. 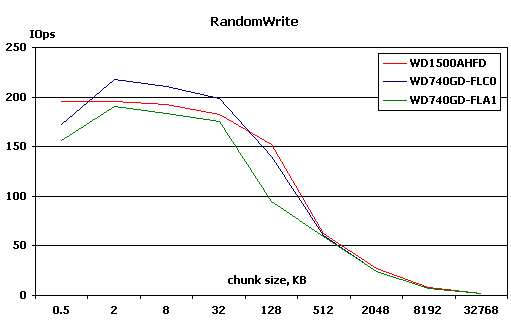 And well, why should you be pushing write requests into the narrow bottleneck of the 32-commands-big buffer when there is a huge cache buffer at your disposal! It means that when the drive is receiving write requests, it just stacks them down in the cache and reports a completed operation without yet writing anything to the platter! It is going to be a very, very fast drive from an outside observerвЂ™s point of view. Generally speaking, deferred writing is a very helpful feature of all modern hard drives for desktop computers, and it is largely due to the ever-improving algorithms of adaptive deferred writing that the performance of hard drives is getting higher year after year. A modern HDD already comes equipped with as much as 16 megabytes of cache memory and may call for even more in the future. Even half that size (supposing one half of the cache is allocated to look-ahead reading and auxiliary tables) can store as many as 16384 sectors if necessary. Of course, no one is going to create so many cache segments. The more segments there are, the bigger the overhead is. Suppose we know where the driveвЂ™s heads are right now and we are to find out the processing order for the deferred write requests. The more segments there are in the buffer, the more time it is going to take to calculate the optimal order. Do you see that strange hump at the beginning of the write graph? ItвЂ™s because the drive found out that it was being bombarded with small random-address requests and tried to withstand the DoS attack by collecting the requests into its cache. I donвЂ™t know how many cache lines it opens up at that, but the solution looks very elegant. Such a logical caching strategy of MaxtorвЂ™s drives has even misled some reviewers into confusing access time with seek time :). But letвЂ™s get back to the subject of our review again. In this section weвЂ™ve found out that the WD1500AHFD-00RAR0 hard disk drive does support NCQ technology. I donвЂ™t claim yet that NCQ hasnвЂ™t proved its superiority over TCQ. After all, IвЂ™ve only tested one drive so far. As I promised above, IвЂ™m going to discuss the drivesвЂ™ speeds at processing random read/write requests at more length now. At first I showed you how the new Raptor reacts to random requests the size of a sector, i.e. 512 bytes. But what if the data block is larger? We may see some anomaly or, if there is none, we just get the dependence of the random read/write speed on the size of the data block. The drives may even end up doing linear reading. A general observation from the two diagrams above is like follows: random reading/writing does not transform into linear operations even when 32MB data blocks are processed. Unlike our colleagues, we do not use NBench for explorations of that kind. Since modern hard drives come with as much as 16 megabytes of cache memory, we need a means to force as big an amount of data through the driveвЂ™s cache as to minimize the measurement error due to deferred writing. 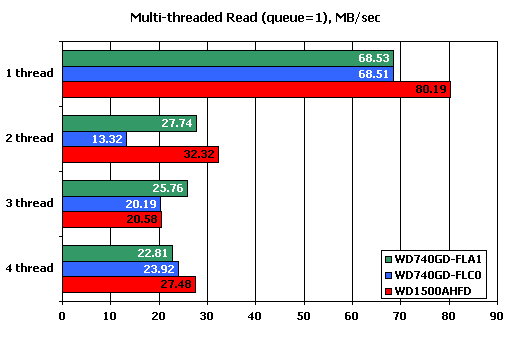 NBench would be always reporting a write speed higher than the linear read speed because the drive reports an end of a write operation before the tail of the file in the cache is actually written on the platter. So, we use IOMeter instead and run it as long as to exceed the driveвЂ™s cache buffer in two times at least. We create four simultaneously running threads (an individual worker , each with its own portion of disk space to operate in, is responsible for each of the threads). 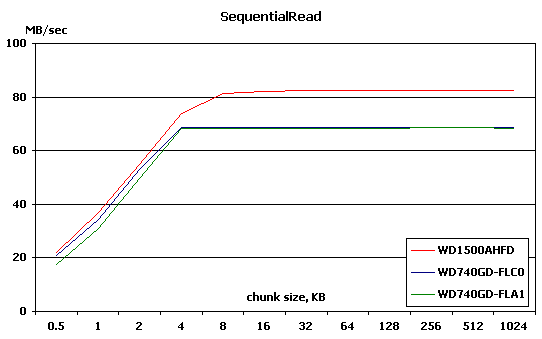 The disk is accessed by 64KB blocks and the outstanding requests queue depth is steadily changing from 1 to 8. 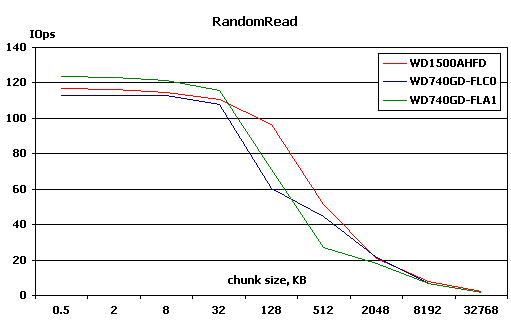 The diagrams below show the results for the queue length of 1 as representative of the typical load on the disk subsystem of a desktop computer. 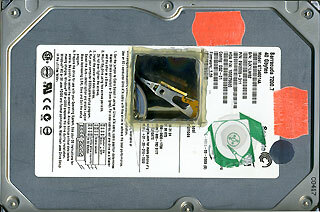 The case with one thread is in fact synonymous with linear reading from the disk. ItвЂ™s no wonder then that the two WD740GD have identical results and the WD1500AHFD is much faster than them. ItвЂ™s different when there are two threads to be processed. The WD1500AHFD is still in the lead while the two WD740GD models have split up. 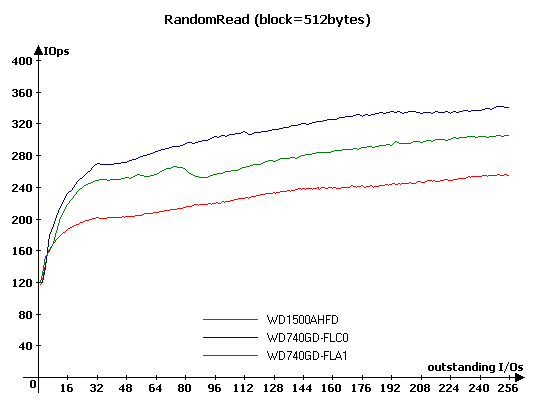 The вЂњwildвЂќ WD740GD-FLC0 is suddenly much slower than its brother. This is the consequence of its optimization for random operations and of its reluctant look-ahead reading. As you can see from the formula, smaller loads have greater weights in the overall result because they are more typical of a workstation. Thanks to its higher speed under low loads, the WD1500AHFD has got higher ratings irrespective of how much of the driveвЂ™s storage space is in use. And now I will try to evaluate the performance of the drives using FuturemarkвЂ™s PCMark05. Besides everything else, this benchmark includes a set of hard disk drive tests. The tests are simple: the user can run the drive along a prefabricated trace. A trace is in fact a log of access to some вЂњdefaultвЂќ hard disk drive which was mercilessly tested in FuturemarkвЂ™s laboratories. The tests can be run separately or all in a batch. I chose the second option, perhaps wrongly. 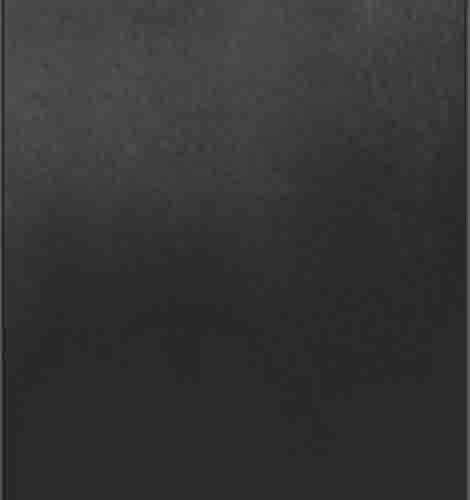 The fact is each decent hard disk drive wants to be a вЂњblack boxвЂќ. And it wants to be a block box that reacts to a request on its input depending on the entire history of earlier requests. By running the tests in a batch, we pass the drive through all the traces one by one. It doesnвЂ™t have time enough to get used to one trace, but we already start another. On the other hand, it would be strange to run the XP Startup trace a dozen of times because it is assumed that the booting of the OS is done after a cold or warm restart of the computer, and at this moment the hard drive is reinitialized, i.e. the accumulated access statistics is cleared and the drive is reset into some вЂњinitialвЂќ state. Anyway, the test conditions were the same for all the participating devices, so we can compare the results. So, the WD1500AHFD is again on top. The вЂњwildвЂќ WD740GD can provide some competition to it on the XP Startup trace, but on all the other traces the Raptor X is unrivalled. IвЂ™m rather doubtful about the results of the drives on the Virus Scan and File Write traces because the measured speed of the drives is higher than they can physically do. In this review we have thoroughly explored the new hard disk that Western Digital targets at computer enthusiasts, the people who want to have the most advanced and fastest components in their systems. ItвЂ™s none of my business whether they actually need that speed. My goal was to see how well the Raptor X suits the market niche WD is promoting it into.